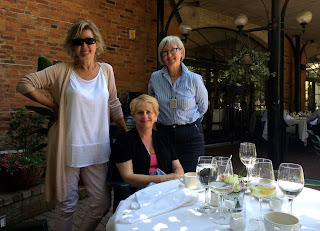 The Garden Blogger's Fling went to Toronto, Canada, June 5, 6, 7 (& an optional June 8 in Niagara), 2015. It was the first official international Fling. 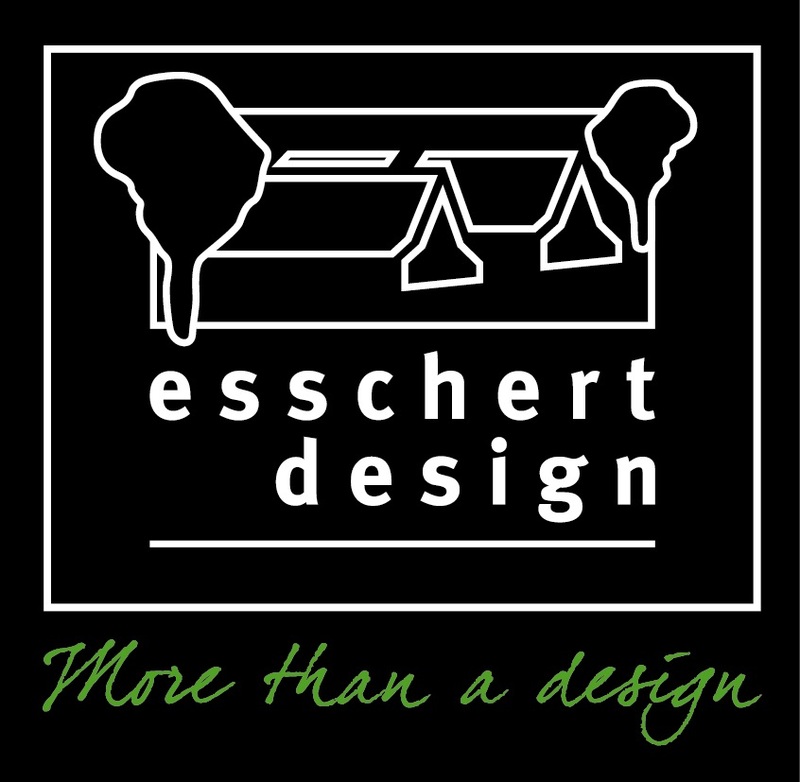 This tab includes the basics about the event, plus links to a few teasers we used to get our attendees excited. For more posts, click Toronto Fling here or in the sidebar (click the sidebar for other Flings, too). We loved hosting you in Toronto! The Toronto Botanical Garden, setting for our closing dinner. 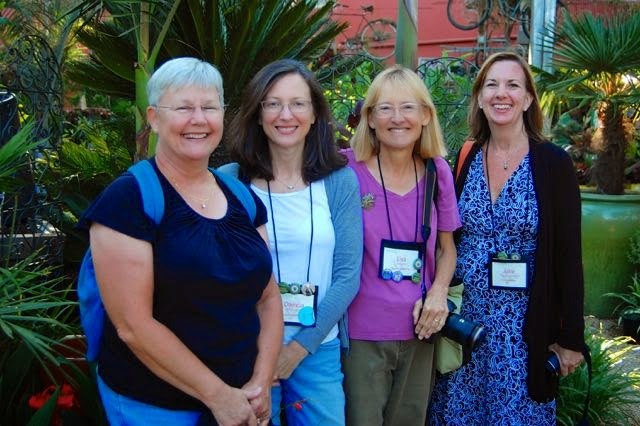 The Garden Bloggers Fling is a volunteer-run event, hosted by a different city each year. To contact the organizers, see our Contact page. Wondering who (or who else) came to the Toronto Fling? This link's for you. 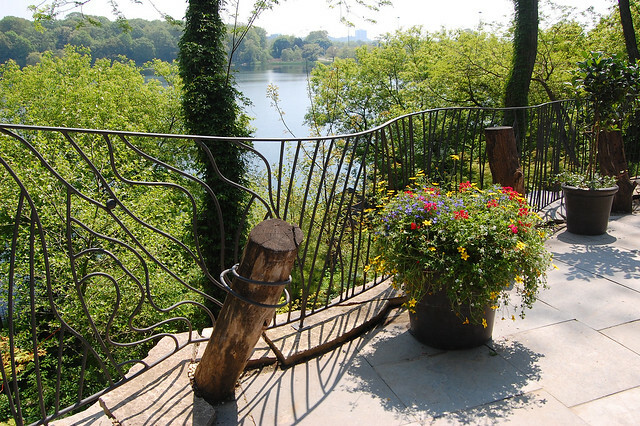 A view of Grenadier Pond is just one of the delights in our Swansea gardens. 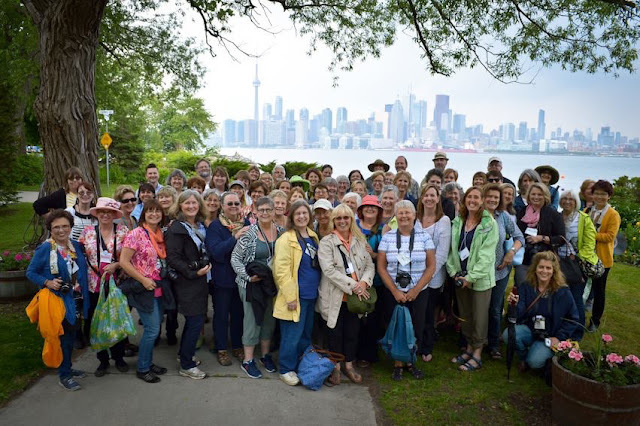 While there's still a detail to iron out here and there, we're excited that we can now share the broad strokes of what you'll see and do at the Garden Bloggers Fling 2015 in Toronto. If you haven't signed up, and this whets your appetite, we still have a few places left. Email me! Don't sweat the actual times yet – you'll get a detailed itinerary with your registration package. In case you've come late to the party and missed our post – Lee Valley Tools is hosting our welcome fest in a big way. You'll want to be there. Really, you will. Tip: Leave room in your suitcase and be ready to check your bag on your return flight. The Parkdale garden of (and floral demo by) Sarah Nixon of My Luscious Backyard – a real "slow flowers" story. See a news feature about Sarah's business here. A look at site restoration at Toronto's High Park, with info on invasive species, especially in Toronto's native oak savannah habitat. High Park is Toronto's Central Park or Hyde Park. We'll explore two (possibly three) neighbouring gardens in the Swansea district. Some overlook High Park's Grenadier Pond. Note: On the Island side, we'll stop at the docks for our Toronto Fling photo op with a skyline background! Wear your best smiles. 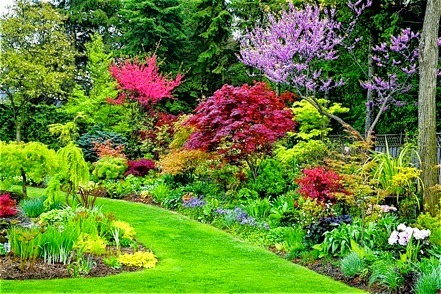 Then, a preview of the Toronto Island Garden Tour, with as many as ten cottage gardens to tour at your own pace. We'll give you a map and set you free. Friday dinner on your own. 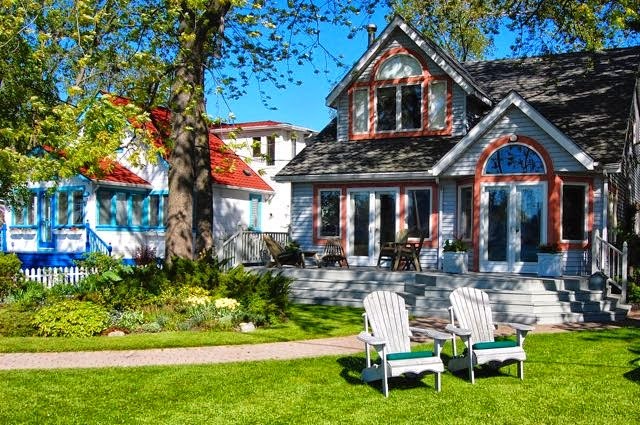 If you're on the Island, you might try the Rectory Café or the Island Café for dinner. Both are a short walk from the Ward's Island ferry docks. No return ticket required. Friday evening – hold this space for bzzzzzznzzz we are arranging with Burt's Bees. Details TBD. Earlybirds can begin the day by walking with Helen to St. Lawrence Market, our historic downtown farmer's market, for breakfast. The Canadian back bacon on a bun is a fave, but there are more gourmet options. The Market opens at 5 am on Saturdays – we don't have to be quite as early as that! Walk back to the hotel, so the buses can take us to Forest Hill, where we'll tour two very different gardens, a few blocks apart. Check that link for teaser pics. 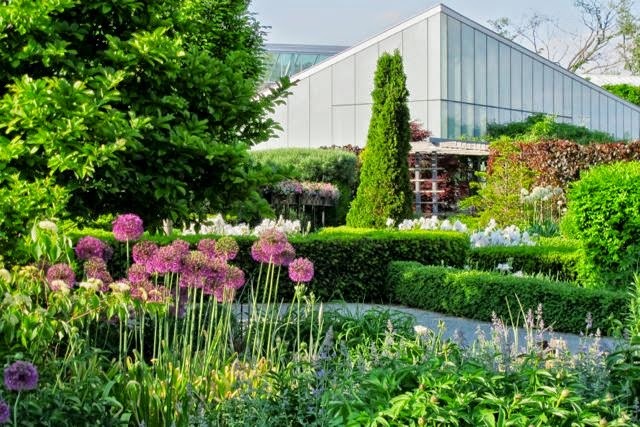 Then we head north to visit the garden of Marion Jarvie for our own private tour. Marion is plantswoman and true collector, and her half-acre space is filled with unusual species and specimens. 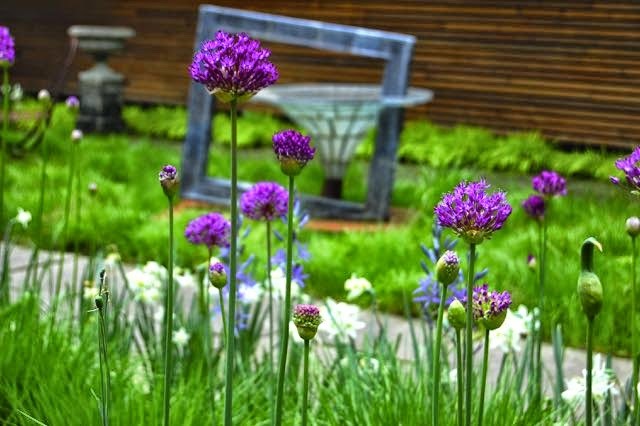 With one of Marion's four Open Gardens having happened the weekend prior, the garden should be in top form. Yes, we'll feed you lunch; details in the works. 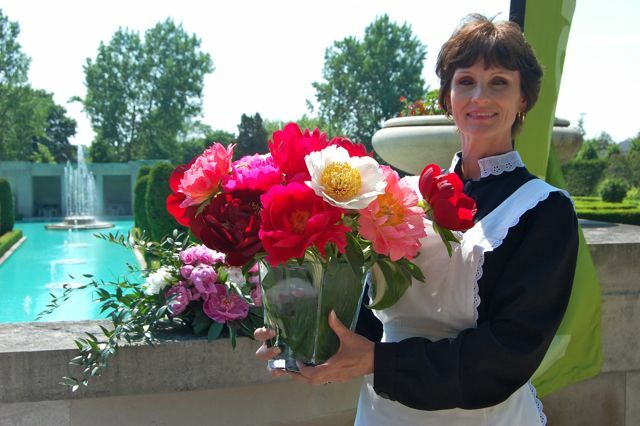 Parkwood Estate and (we hope) peonies! Next, get out your Downton Abbey millinery! We head out of town to visit Oshawa's Parkwood Estate, the historic stately home of R.S. McLaughlin, one of the parents of General Motors. 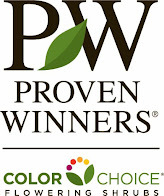 Parkwood is planning some special things for us, but details will be a surprise. 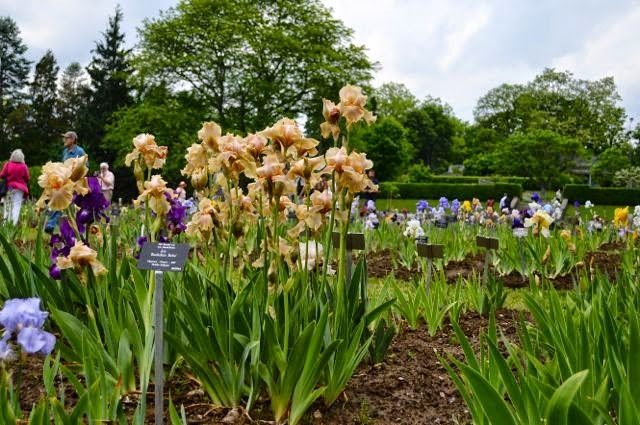 From here, we're crossing our fingers for fine weather, because our next stop, a few minutes away, is the peony garden at the Oshawa Botanical Garden, with (with luck) 300+ species of peony gloriously in bloom. 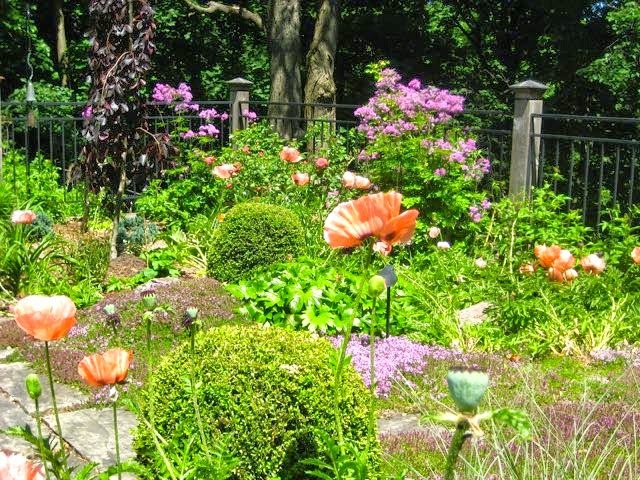 Our last stop of the day is the Bluffs-area garden of Ellen Carr, president of the city's largest, poshest garden club, the Garden Club of Toronto. Our picture gives you a wee peek, including a corner of the thyme lawn. 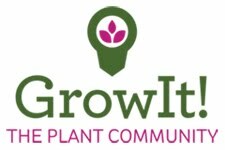 Saturday evening – our bloggers' chat with You Grow Girl Gayla Trail. Check the link for info, with exact time and place to come. Have we exhausted you yet? Get ready for Sunday! We begin in Cabbagetown, which I wrote about just yesterday. 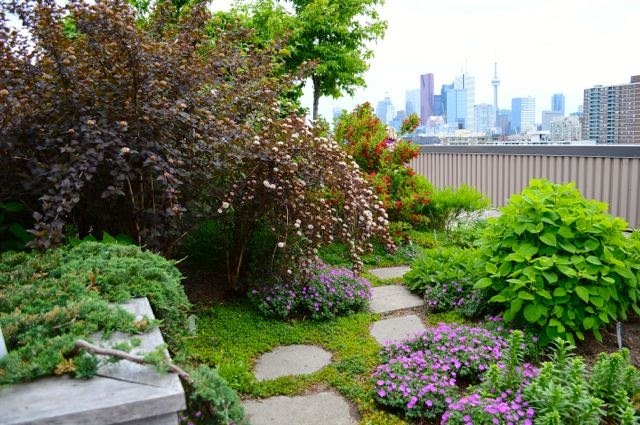 In addition to the gardens we've told you about, we're hoping we'll have time to visit the Hugh Garner Rooftop Garden while we're there. It's a special place. Then we head to the Evergreen Brick Works, a heritage industrial space that has been transformed into a nature preserve and education centre – as well as an organic farmer's market. Sarah wrote about it a few years ago. 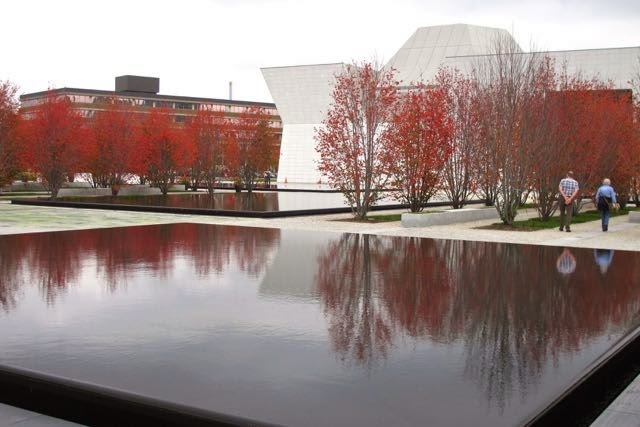 Our first stop of the afternoon will be the brand new Aga Khan Museum – which was quite a coup for Toronto when it opened just last fall. It's shown in our photo shortly after opening. We'll break into three groups, and circulate between 20-minute tours, including the dramatic grounds and a look at the striking contemporary architecture. Then we all head to the lovely certified wildlife habitat garden of Siri Luckow, not far away. We close our day – and the official Toronto Fling – at the Toronto Botanical Garden for garden tours, cocktails, dinner and more! 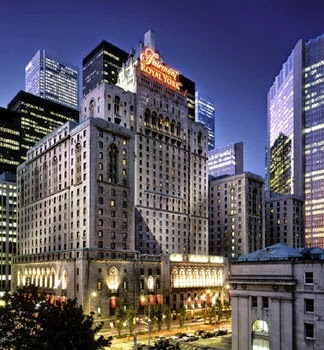 Buses bring you back to the Fairmont Royal York, well fed and well fêted. If you need to go to the airport directly from the TBG, please let Helen know asapASAP. And stay tuned, soonish, for our optional Niagara day itinerary. P.S. 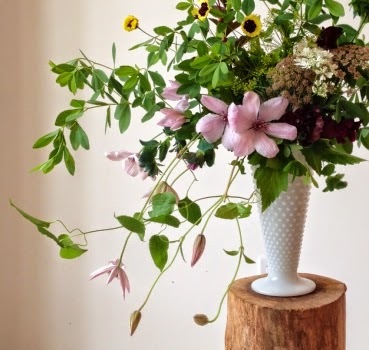 Sarah is organizing a small, unofficial excursion to Wild Flower Farm on Tuesday, June 9th. Let her know on the Fling Facebook page if you're interested. Excellent! And now's the perfect time to visit.